Converse All Wah shoes are the new shoes that also function as a Wah pedal. Guitar players tighten your laces, Converse has completed the design for the All Wah. The new shoe also functions as a Wah pedal for your guitar! So now that a shoe can also be a Wah pedal there are tons of questions to be asked. Here are a few answers to your many questions. 1. What Are These Shoes Called? 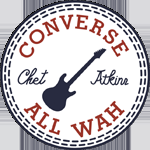 Converse has named the new shoes “The Chet Atkins All Wah” or “All Wah” for short. The shoes are named after Mr. Guitar, Chet Atkins. Atkins was the first guitarist to use a Wah pedal on one of his songs. The All Wah’s are rightfully named after Mr. Guitar since they are the first shoe of their kind. 2. What Does The All Wah Shoe Look Like? As of right now, it appears that the All Wah only comes in two styles: white or black high-top Chucks. There are holes on either side of the toe area (on the white shoes) or holes on either side of the heel area (on the black shoes) for the audio cord to be plugged in. 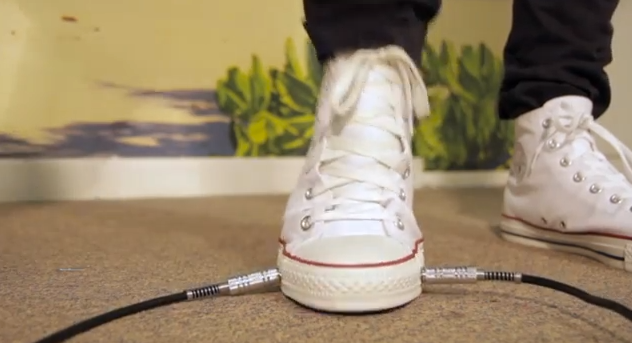 Aside from the holes for the cable to hookup to, Converse stuck with the traditional style that many musicians love to rock on and off stage. 3. How Does The All Wah Work? Though it is a very complex shoe, Converse has made the All Wah very simple and user friendly. All you have to do is hook the cables up the way you normally would. One cable running from your guitar to your All Wah shoe and then the other cable running out of the other side of your shoe and into your amp. Or, you can use the All Wah wirelessly via Bluetooth with an iPhone or Mac computer. The All Wah is also charged wirelessly. The shoes’ audio path retains a pure analog signal. 4. Is Converse Doing It Alone? No, Converse has partnered with Cutecircuit. Cutecircuit is a wearable technology brand out of London. 5. When And Where Can I Buy The All Wah? As of right now, Converse has not released any information as to where to purchase or when to purchase a pair of All Wah’s. The prototyping for the shoes started back in 2013 and the first pair of All Wah’s were just shown to the public in 2016. Since it is such complex design for a shoe, it could be a while longer before Converse starts making All Wah’s available to the public. To stay updated on the All Wah and when it might be available you can check here. There are so many questions to be asked about this shoe. Will the All Wah soon replace all Wah pedals? Or will the All Wah end up being something only the rich and famous musicians can afford? But most importantly, will musicians want to use the All Wah? Sure, the All Wah serves the same purpose and is more convenient that an actual Wah pedal; but musicians might not be comfortable with replacing tradition with technology. It all serves the same purpose, but will comfort and tradition outlast new techonology?